view the light-level data on an Assetwolf portal. Here's how we put our simple system together. An Assetwolf portal. We connected up our Arduino, with it taking analog input from the light sensor, using its A/D converter to convert this to a number. (You might of course have other kinds of data input, but the light level is a simple example to explain the basics of sending such data to the IoT cloud). We then created the following program in the Arduino IDE. open the serial monitor to see the console output. // Create a BridgeClient instance to communicate using the Yun's bridge & Linux OS. // Setup a feed called 'assetPub' for publishing. The code relies on the Adafruit MQTT library. The first few lines include the necessary libraries. Next, the code specifies the connection parameters to the Assetwolf portal. The exercise can be undertaken with a free portal, and in the above example uses the non-secure connection, so that the Arduino can connect to port 1883 of the MQTT broker. In the Feeds section, notice how the Arduino will connect to a topic of the form: up/client/USERNAME/asset/DEVICE_ID. Although the device ID must be, it will need to be repeated in each message's dataframe. In the main Sketch, the setup() function is short, and basically just initialises things by running once. The loop() function does most of the work and is called over and over. It starts by reading in the analog light level value, and compiles the payload. It publishes this to the MQTT broker, then finally does a 5 second delay. You first need to create an Asset Type. 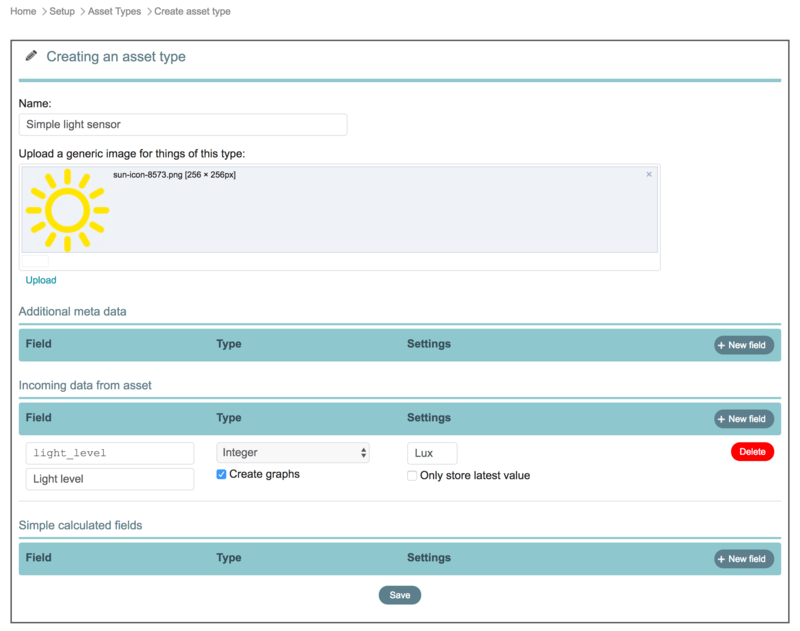 You should be taken straight to this screen after your portal is created but you can always make more by looking for Asset Types under the Setup menu. This is the generic type of "thing" you'll be connecting. We'll make one called "Simple light sensor". Since we want to receive the light level from our Arduino we'll make a field under the "Incoming data from asset" section. We will call it light_level (to our payload parameter in the code above). Now we can create light sensors! Create one from your dashboard and give it a Device ID (a unique identifier for this Arduino). It's important that the asset type is set to "Simple light sensor" and that the Device ID matches the one in the Arduino program. Send your Arduino code to your Arduino and make sure it is running. 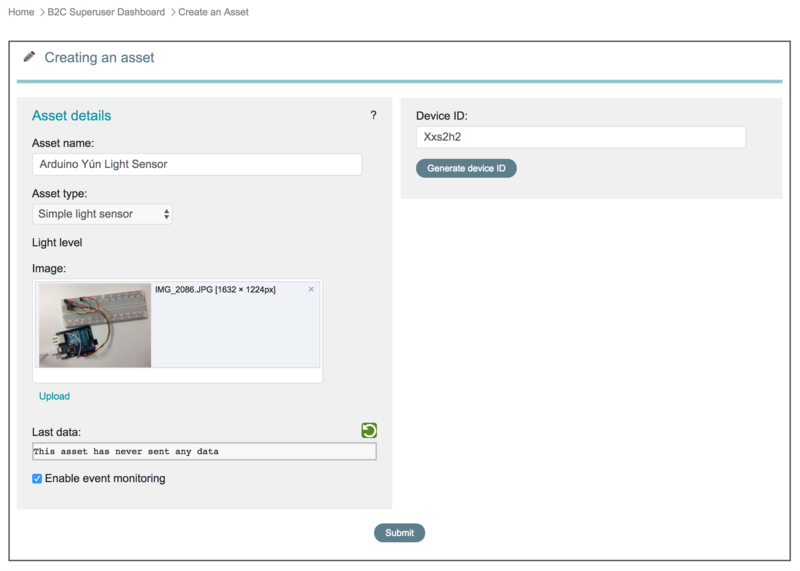 If the connection parameters are correct, the IoT portal should start receiving data immediately. You can see the light level graph from the Asset detail page, where the standard portal should show you a list of fields. Click the light_level field to see its graph. Heres an example from one running in our office. The above example ought to work on any Arduino Yun, and with minor modifications on other Arduino's (possibly you may need to add libraries for network shields or other connectivity). We hope you enjoy it! To try this yourself, create an portal here.